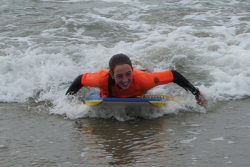 Surf, sky or land – camps are always grand! Our Year 7 and 8 students recently experienced the wonderful opportunity of spending time off-campus on their annual camping trips! Year 7 had three days of high energy and fun-packed activities, whilst Year 8 got back to nature and thoroughly enjoyed activities on land and in the water. On your marks … get set …GO! 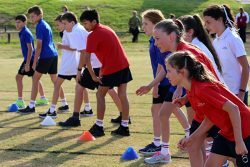 Both our Junior and Senior Schools participated in the annual House Athletics Carnivals recently with Gibeon Warriors (Red House) and Zion Crusaders (Blue House) taking out the trophies for Junior and Senior schools respectively. Students really got into the spirit of the Carnivals, whether they cheered from the sidelines or participated in an event and there were many highlights and records beaten. 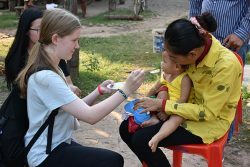 In January this year, 21 of our Year 12 students, four teachers and three members of the Samaritan’s Purse organisation took part in the Cambodia Discovery Trip. Jessica Cornish shares her once in a lifetime experience with us. Read the full article in the latest edition of The Vine. Saturday 4 May 11.00am – 2.30pm Oxley Christian College is celebrating it’s 40th year and we warmly invite you to attend our Open Day where you can join us in the festivities. Students and staff from our Junior and Senior Schools will be delighted to show you around our beautiful campus. Calling all past students! 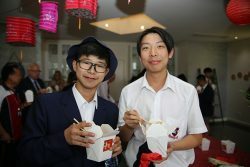 Oxley Christian College is celebrating it’s 40th year! In recognition of this milestone we would love all past students to join us on Open Day for a reunion. If you were part of the graduating Class of 2014, 2009 or any class between 1979-1999, spread the word and come and join your peers in a get-together from 1.00pm, Saturday 4 May in the Senior School Building. Success in the pool was clear as blue and white! 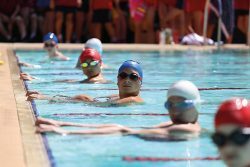 Both our Junior and Senior Schools participated in the annual Swimming Carnivals recently, with Tabor Trojans (White House) and Zion Crusaders (Blue House) taking out the trophies for Junior and Senior schools respectively. There were many highlights and even records beaten! The 2019 school year off to a great start! On Thursday 31 January we welcomed the 2019 student body for the new school year. We were particularly happy to see many new students commencing their educational journey with us! Mrs Weller and Miss Monro welcomed the Prep students on their first day of school, with fun activities planned for them in their classrooms, whilst our new Year 7 Coordinator, Mrs Connelly, was joined by the Year 7 teachers, as excited students arrived with boxes full of resources for use in the coming year. We extend our congratulations to the Class of 2018 on the wonderful results they received today. We are delighted with the outcomes to their dedication and hard work. College staff acknowledge these achievements and pray the blessings of Christmas will follow students into the New Year. Oxley Stadium is proud to host Life Ministry Church’s Christmas Light & Sound Show 2018! The show will run from 9 to 24 December from 9.00pm to 11.00pm with four 30 minute sessions each night. 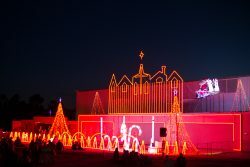 Commencing in 2006, the show’s desire is to provide the community with a spectacular event that families may come and enjoy during the special season of Christmas.